Independent audit report Statement from the Australian National Audit Officeabout the electronic presentation on this website of the audited financial report of ASIC for the year ended 30 June 2005 (PDF file, 184 KB). Building confidence in financial markets: ASIC annual report 2003–04, Media release 04-374, 17 November 2004. Independent audit report Statement from the Australian National Audit Officeabout the electronic presentation on this website of the audited financial report of ASIC for the year ended 30 June 2004 (PDF file, 184 KB). Independent audit report Statement from the Australian National Audit Office about the electronic presentation on this website of the audited financial report of ASIC for the year ended 30 June 2003 (PDF file, 147KB). Read our media release 03-351 ASIC Annual Report 2002-03 'Enforcement an essential part of regulation', released 5 November 2003. Our annual report for 1998-99 received a Gold Award from Annual Report Awards Inc, for the first time, being in the top 12 of 346 entries from companies, associations and government bodies. This means we produced a model report achieving overall excellence with full disclosure of key aspects of what we do. 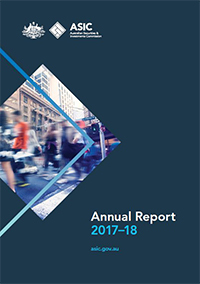 You can view copies of ASIC annual reports at these libraries.